Ruth Pickering, Co-Founder and Chief Business Development and Strategy Officer. Pickering has worked for both blue-chip corporations and startups, has extensive experience across product development, program management and strategy. With experience as a managing director of large organizations, Pickering has managed both strategic planning and execution of multiple $ billion product lines. An experienced leader, Pickering has the proven ability of building and managing teams in different organizational structures and delivering results to tight deadlines. Pickering’s experience spans form media technology and telecommunications, where prior to Yewno, she served as managing director of BT Wholesale; was one of the Global Telecoms Business top 40 under 40 in 2010, and was shortlisted for ‘Woman of the Year in Technology' in 2011. Pickering holds a BA (Hons) from the University of Warwick, a diploma from the Institute of Marketing, a Corporate Finance Certificate and Strategic Planning Certificate from London Business School. In today’s world of instant communication and online access to vast stores of data, researchers and students have greater access to information than at any time in history. But as information has become more and more available, it has also become increasingly dispersed and fragmented, and the path to knowledge more challenging than ever. How can a library help researchers more effectively and meaningfully navigate this ocean of data? Traditional keyword search systems produce valuable results, but function in a linear way. Heaven help those researchers who only get exactly what they ask for! Those of us who have been involved in the development of Yewno believe that we have found a new approach – a new philosophy of research, if you will – that offers a leap forward in the world of library discovery. Yewno Discover is very different from a traditional discovery product. 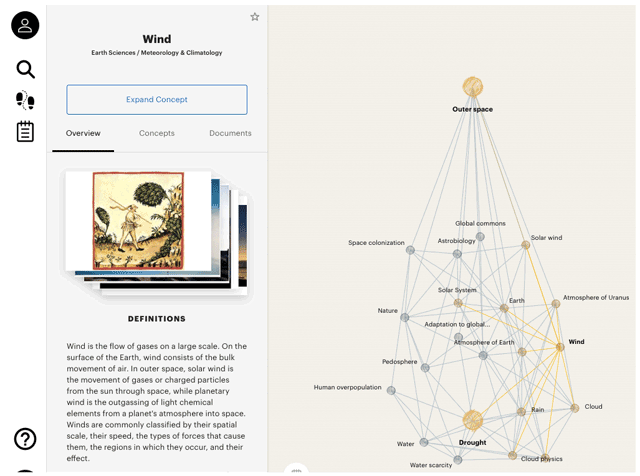 It is a whole new approach to knowledge and information, fueled by a visual explorative design and the latest developments in artificial intelligence (AI). Yewno Discover, which was launched in 2016, is designed to drive users to explore across more concepts and has already been enthusiastically adopted by both major research universities and small colleges in the US, UK and Germany. Yewno Discover provides the next generation of discovery, facilitating deeper knowledge extraction by connecting disparate yet related concepts through semantic relationships to build a human-like inference engine. It combines the most powerful components of computational linguistics, neural networks and data visualization, purposely designed to usher in a new era of enlightened knowledge discovery. Yewno Discover does not search for keywords – it allows for the exploration of concepts, enabling individuals to solve ‘what if’ possibilities and uncover connections they never knew existed. The idea for Yewno came from the need to make sense of ever-increasing data sources that are continuously fragmented and dispersed. Yewno’s founder and CEO, Ruggero Gramatica, first applied what was to become the Yewno concept in the field of life sciences. A biotech company in Switzerland was interested in exploring how they might repurpose existing biological molecules to cure rare diseases, and Ruggero developed an algorithmic approach to add scale to the research effort. 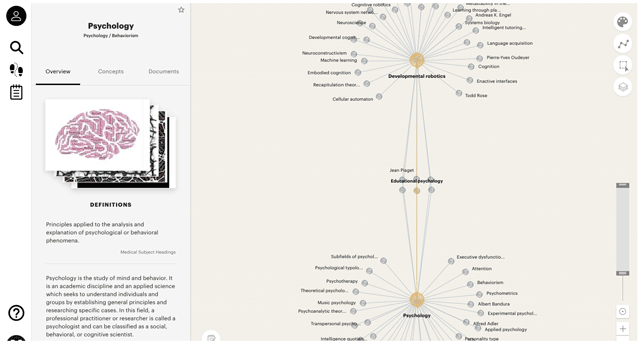 He then converted the original idea into an analytical framework to take in and process almost 23 million medical documents and create a dense biomedical knowledge graph. From there, a stochastic algorithm uncovered the biological mechanism of actions relevant to the eventual repurposing of drugs. That idea evolved into the current Yewno Discover. In 2013 Michael Keller, University Librarian at Stanford University, approached Ruggero with the idea that the concept might be applied to developing a new way for faculty and students to find previously undiscovered concepts across cross-disciplinary information and better utilize the University’s substantial library collection. Ruggero and his team created an AI-based solution, that we came to call an inference engine, to meet this challenge. After the pilot for Stanford was complete, Ruggero and his team realized that the concept could be readily applied to the benefit of all colleges, universities and corporations, and that a Silicon Valley start-up might be in the making. Yewno was on its way! The name Yewno came from a play on words: ‘You know’. It also refers to the English yew tree and its mystical significance as a tree symbolizing transformation and rebirth. There are many parallels between trees, growth, structure and knowledge, which is the epistemological mission of Yewno. Yewno was established in Redwood City, California in 2014 in the heart of California’s Silicon Valley. Ruggero, who had done five previous start-ups in Europe and the US, calls Silicon Valley the ‘enabler’ for the company. Hiring was a challenge in such a hyper-competitive technology job market, but Yewno now boasts a talented team. The emerging Yewno team built an early proof of concept model and immediately saw a sense of engagement from the researchers who experimented with the Yewno Discover prototype. The model received an enthusiastic reception. One early user’s response summed up the thrust of the feedback: ‘I’ve been dreaming of something like this for ten years’. The most powerful feedback has been from students and faculty who have used the system. Our partner libraries have found that if you give library users access to Yewno Discover for a particular assignment, nine out of ten will come to a different conclusion than they would have come to without access to the product. We did research and have validated this statistic. If you think about it, it’s not so surprising, as Yewno Discover reveals connections and research paths that the researcher would never have found without it. With Yewno Discover, researchers and learners of all types can get a deeper understanding of the information at hand. Unlike traditional search, which strives to provide the singular correct answer as quickly as possible, Yewno Discover enables the connection of multiple concepts and information – it is a highly effective brainstorming machine. Through Yewno Discover we have created a broader and more lateral way to generate a true signal in today’s noisy digital world. As can be seen from the screenshots accompanying this article (Figures 1, 2 and 3), the Yewno Discover search results themselves form a visual browsing experience. Concepts are connected to other relevant concepts through an interactive web. 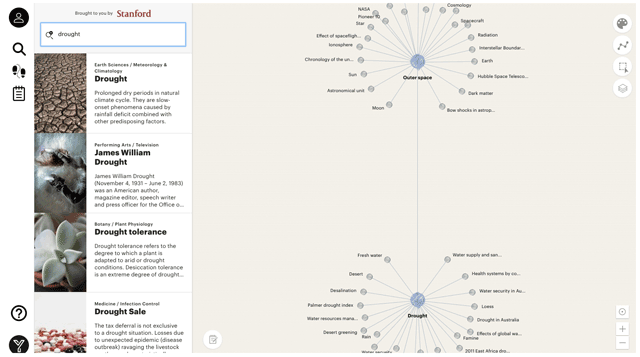 This visual map of the relationships and connections between people, events and concepts allows the user to see how closely concepts are related to each other, as well as the frequency of related concepts by the number of links to other items. All elements of the graph are clickable and clicking on any concept provides direct access to the documents that concept contains. Ruggero notes that he was not initially looking at education as the starting point for the Yewno project – he first created the Yewno concept in the field of economics research and commercially applied the technology in the life sciences industry – but as the Stanford project developed it became clear that the Yewno concept might offer a dramatic and multidisciplinary (or interdisciplinary) expansion to the traditional library discovery environment. Yewno Discover now contains over 120 million items from 500 academic and scholarly sources to ensure that the Yewno knowledge set is as authoritative and comprehensive as possible. It is obvious that a search system is only as good as the information set to which you apply it – given that we are supplying the product to research institutions, we had to have a first-rate knowledge base. We talked to our client libraries and identified both mainstream and niche publishers that were at the top of their priority lists. Although major research institutions are obvious adopters, we have also had a lot of interest from institutions of all sizes. Yewno Discover’s intuitive and easy to use inference engine provides a totally new way of organizing, displaying and thinking about information. Librarians at colleges and universities both large and small are enthusiastic about offering such a new and innovative product to faculty and students. For teaching- and learning-focused schools, the growing data set gives users access to a world of information far beyond the walls of their own libraries and supports libraries and teachers establish the fundamentals of essay and research training for undergraduate students. Our recent user interface design update has also broadened the product’s appeal to high schools and public library users. One of the reasons that the roll-out of Yewno Discover is going smoothly so far is that we spent so much time developing prototypes with faculty, students and library staff of institutions that were excited by the concept and had the bandwidth to serve as early adopters. We would not be where we are today without the patience and valuable feedback provided by these libraries. We have taken a very interactive development approach and the learning that we have done in rolling out these prototypes with users has allowed us to evolve the product faster to meet user needs. Although Yewno Discover has been in use at some of the largest and most sophisticated universities in the US, a library does not need to be on the cutting edge of technology to install and use the system. The great news about an AI solution like Yewno Discover is that it places almost no burden on the library IT infrastructure! Yewno Discover is software-as-a-service (SaaS) with nothing to install locally and no local infrastructure to maintain. The fact that Yewno Discover is a totally new service is very exciting to librarians and their users. But the challenge of introducing an innovative new system includes finding the funding to make it available to their users. In recognition of this reality, we have worked hard to make Yewno Discover affordable to institutions of all sizes and priced it to be accessible to all parts of the market. The Yewno Discover environment provides users with many new channels of access and can dramatically increase the use of materials in the collection that were previously untapped by traditional search systems. Library holdings become better utilized as they are more discoverable and return on investment (ROI) for dollars spent on content is increased. Users find and use materials that they would never have found in a traditional search. Like all AI-based solutions, Yewno Discover is disruptive. By positing a whole new way to access knowledge, Yewno Discover has the potential to significantly enrich the research and learning environments at colleges and universities of all sizes. It offers an exciting opportunity for librarians to lead students and faculty in a shift in thinking about the role of the library – from the linear management of information to the creative lateral thinking that is so vital to the pursuit of knowledge. The same motivations drive our growing product portfolio in the Education, Publishing, Finance and Life Sciences sectors.